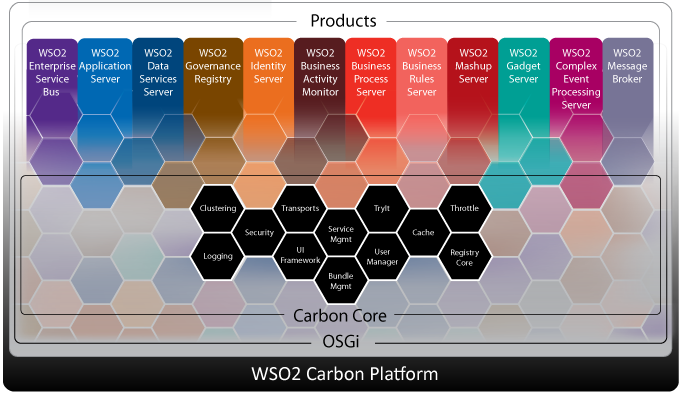 The lean, complete, OSGi-based WSO2 Carbon platform includes a range of SOA products that deliver messaging, data, business, presentation, identity, security, governance, monitoring and management services. You can select and use the services to fulfill your middleware requirements. Maybe all you need is just an Application Server to host your applications or maybe you need an Enterprise Service Bus and a Data Services Server or more depending on your requirements. The full stack of products and their uses are listed below to make you aware of what each of them has to offer in terms of middleware capabilities.